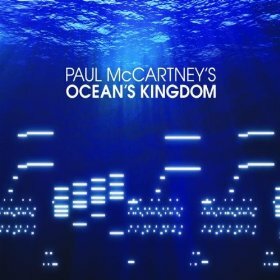 While the concept of classic rockers going classical is not altogether new, Paul McCartney taking on the task again with his new album, Ocean’s Kingdom, does bring with it a new level of curiosity. After all, the former Beatle has not closed the door on Rock-n-Roll like Billy Joel or taken up the lute like Sting, so one wonders when you’re “almost” as popular as Jesus, why continue trying to break ground in a new genre? Sir Paul’s classical works may be an extension of artistic exploration or just a change of pace, but either way they are developing and this new work, staged as a ballet, is quite different from his earlier works like Liverpool Oratorio both in length and substance. The title is very apt as the orchestration has a definite ocean essence with very calm and organic sounds occasionally countering more playful staccato melodies although there are aspects that seem to have a Western feel. Regardless, it doesn’t have much of a “McCartney” sound. The music has an expectantly visual, cinematic feel, so much so it might be just as easy to illustrate a review of this album as write one with its varied emotional passages ranging between peaceful and triumphant. If you’re hoping for something that sounds like its picking up where Sgt. Pepper left off, this isn’t it. But if you’re a minor fan of classical, a major fan of McCartney, or if you just happen to have a 3D IMAX film of ocean life that’s hurting for a soundtrack, Ocean’s Kingdom is the album for you.